Talking about Fried Rice, there was a mobile chinese food stall at the end of our street which used to sell, veg and egg noodles and fried rice, manchurian, chilli chicken etc. But the name on the van read “Cheneese Needles and Fast Food”. The food was excellent, and by the time it was 6 in the evening, there used to be a huge crowd. Cook Rice, adding little salt to the water. Heat oil in a wok and add chopped onions, garlic, ginger, green chillies. Then add all the chopped vegetables and stir fry. Vegetables should be crisp and not overcooked. Add Ajinimoto and soya sauce. Stir-fry for 2-3 minutes and serve hot. Simple and easy. The best choice when you do not have much time to cook. 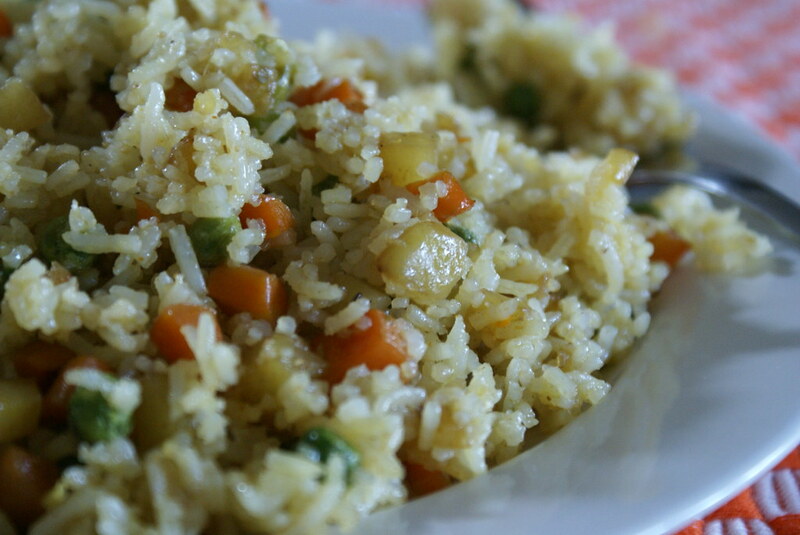 Girl, I had such a maddening craving for fried rice in Guyana and had it often! It is one of my favourite ways to have rice. Yours looks flavourful. All I need is a spoon, no fork will do (lol). Hey I like your page header…very nice. Sig, Thanks. Even I miss Indo Cheenese a lot !!! Hi Uma… Thanks for visiting, I will surely try to post a step by step pictorial soon!